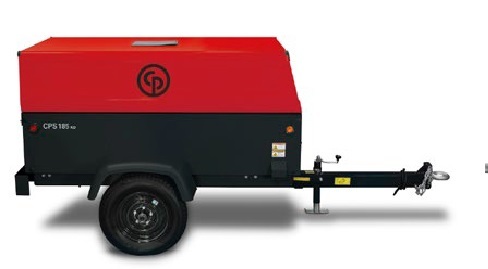 The Chicago Pneumatic CPS185-KD T4F Portable Compressors Provide You With Compressed Air Of 185 CFM At A Working Pressure Of 102 PSI (7 Bar). 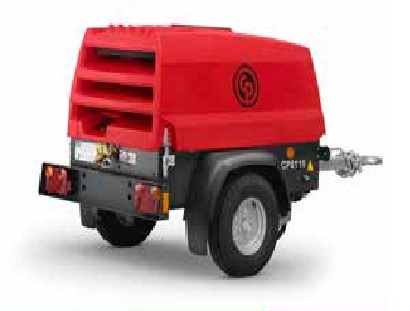 Powered By A Kubota 49 Horsepower 4-Cylinder Diesel Engine This Range Of Portable Compressors Is Typically Used To Drive Various Types Of Pneumatic Tools Including Rock Drills and Sandblast Equipment. The CPS 185 KD T4F Portable Air Compressor from Chicago Pneumatic offers many features other manufacturers charge extra. The corrosion resistant galvanneal steel canopy will ensure many years of service. 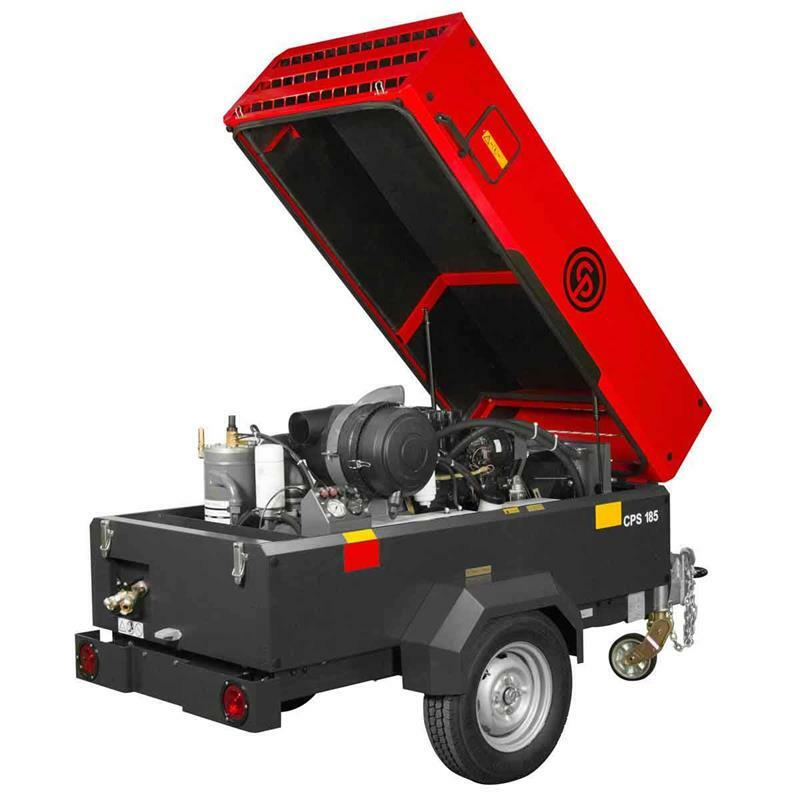 A compact, lightweight design provide greater maneuverability and added safety while towing. The CPS 185 KD features a highly efficient, direct-drive air end that provides 185 CFM of compressed air while using only a 49 HP engine. The control panel and discharge valves are conveniently located at the rear of the compressor. The Chicago Pneumatic MiniSkid Series Of Compressors Are Designed To Be Mounted On Work Trucks And Utility Trailers. Same As Picture Above Less Trailer, Axle, Tow Bar, Fenders, Wheels And Third Leg. The Chicago Pneumatic CPS Is A Time Proven Design Of Reliability, Easy Maintenance, And Flexibility To Meet All Construction Projects. With Noise Reducing Enclosures And Straightforward Control Panels CP Air Compressors Are Quiet And Easy To Use. The Conveniently Rear End Mounted Control Panel Offers Protective Shutdowns For High Engine Temperature, Low Oil Pressure, And High Compressor Temperature. With Its Wide Opening One Piece Canopy Supported By Two Gas Struts Allows Excellent Service Access. * Heavy-Duty Torsion Axle Rated @ 2500 Lbs. * Wet Weight: 2400 Lbs. Due To Weight Restrictions This Unit Must Ship By Common Carrier. This Is An Additional Charge To Sales Price Above. Please Call For Freight Quote Or Supply Preferred Carrier & Account Number In "Messages" On Order Form. Price Above Does Not Include Packaging For International Shipments. Exporting Requires Crating At An Additional Charge. Note: Compressed Air Should Never Be Supplied As Breathing Air Unless Air Is Properly Purified For Breathing. Chicago Pneumatic And Construction Equipment & Supply Do Not Assume Any Responsibility Of Liability Related To Purchasers/User's Breathing Systems.